Logistics 4.0 and Supply Chain Management 4.0 or smart supply chain management concern the various aspects of end-to-end logistics and supply chain management in the context of Industry 4.0, the Internet of Things, cyber-physical systems, emerging technologies, advanced data analytics and (semi-)autonomous decisions enabled by AI. On our Industry 4.0 page we mentioned how Industry 4.0 is about more than just the smart factory or the implementation of technologies. On this page we take a look at the essential elements of smart logistics, logistics management and supply chain management (SCM) in Industry 4.0, often called Logistics 4.0. If you need more than an overview of the essential elements of supply chain and logistics in the age of Industrial IoT, autonomous applications and cyber-physical systems you might want to check out our articles on the use of robots and cobots in logistics, the role and evolutions of IoT (Internet of Things), cloud and advanced analytics in connected logistics or read about digital transformation in transportation and logistics first. It is clear that the various technologies, evolutions and challenges/solutions in these articles come into play when looking at Logistics 4.0, smart supply chain management and the digital supply chain as we do here. So, consider them part of this supply chain and logistics article. 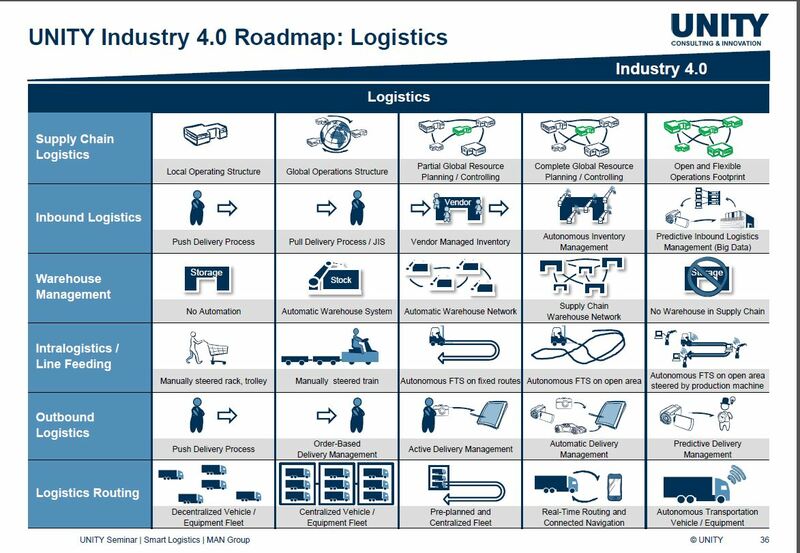 Just as Industry 4.0 is a holistic given with a (partial) transfer of autonomy, intelligence and autonomous decisions to machines and to the edge, supply chain and logistics in Industry 4.0 is very similar, albeit with, on top of the overlaps, different applications, technologies, human and business aspects and elements. There are many types of logistics and there are many definitions of logistics, ranging from the organization, planning and management of something complex, such as the logistics of setting up an event, to activities whereby many moving parts and processes are involved. It’s in the latter sense of moving things (goods, assets, materials, data and more) around in a business, supply chain and Industry 4.0 context that we look at logistics here. When we see logistics as essentially getting things from A to Z with the many intermediary steps and the components of the supply chain and intelligent and efficient movement across all these different steps in a holistic way and add the aspect of autonomy to it we quickly see what types of applications we really talk about: from driverless transportation to intelligent containers, smart warehousing, smart ports, smart shelves to the human and information exchange in all possible logistical chains and contexts. A major game-changer in this regard is also blockchain as we’ll see further with myriad use cases for the distributed ledger technology in transportation, smart ports, cross-border maritime shipping, retail, the list is long. You can imagine that there are several other components in the supply chain and that without a digital supply chain Logistics 4.0 simply isn’t possible. You can also imagine that, just as is the case in Industry 4.0 the Industrial IoT plays a key role, as does a thorough understanding of all data and insights and actionable intelligence for supply chain management. The latter aspect of data, turned into actionable intelligence and ultimately (autonomous, semi-autonomous and human) actions is key to smart supply chain management and logistics in Industry 4.0 and industrial transformation, whereby we looked in depth at several data-intensive elements such as vertical and horizontal integration. It is also important to bring the Industrial Data Space in mind again as a way to enable a secure data exchange between its participants, while at the same time ensuring data sovereignty for the participating data owners. When many moving parts and many processes are involved, the same goes for the data, also in logistics. The Industrial Data Space is just one approach, heavily promoted by the people behind Industrie 4.0. All major players who are involved in the future of logistics have already at the very least looked at the potential of blockchain technology in supply chain management and logistics of the hyper-connected and (semi-)autonomous kind. If they haven’t yet they will soon as the combination of blockchain and IoT, a core component of Logistics 4.0 is accelerating fast. And there certainly are blockchain initiatives in logistics. Just think about the BiTA in the US (Blockchain in Trucking Alliance). Blockchain initiatives in logistics are popping up fast, as are important consortiums (e.g. Maersk and IBM). Also on more local levels there are ample initiatives as this smart port case whereby blockchain is used in the port of Antwerp shows. While we increasingly speak of the digitization and digitalization of logistics and supply chains with the IoT (enabling multiple logistics use case and, along with other technologies such as cloud computing and edge computing or fog computing if you prefer, bringing intelligence to the edge across logistics), digital supply chains and (semi-)autonomous decisions and logistical assets such as self-driving trucks and so forth, the role of people in supply chain management is far from over. Regardless of how autonomous we want systems to be, there remains an important human element whereby supply chain management is changing in the decentralizing context of Industry 4.0 but nevertheless needs people to plan and take actions as not all actions can be or should be automated. To meet the demands and decentralization behind Industry 4.0, however, an automated, intelligent and increasingly autonomous flow of assets, goods, materials and information between the point of origin and the point of consumption and the various points in-between is key. It might sound contradictory but it makes supply chain management more central in this connected and decentralizing movement in industrial transformation and the digital transformation of logistics. As intelligence and autonomy move to digital platforms and the edge, the decisions and tasks of supply chain management become key since there is far more insight and monitoring to decide on overall efficiency. Adding the right level of autonomy and intelligence to logistics in order to make logistics as such more intelligent but mainly to make it more efficient, effective, connected and agile/flexible in order to meet the needs of a far more connected economy and an increasingly real-time economy. Starting from the goals of industrial transformation in this holistic vision of which logistics and supply chains are part, strike the right balance between self-organizing and (semi-)autonomous systems and human planning, with also a focus on action and intelligence whereby the collaboration between man and machine (e.g. cobots in warehousing) and the end goals in function of changing ecosystem demands are crucial. Transforming the ways of working and managing in line with Industry 4.0 deployments, realities and aspects such as data analytics, information ecosystems, required skillsets to manage it all and take the right decision in a changing environment of decentralization, fast decision making, the development of real-time capabilities and agility with a shift from centralized organizational and planning approaches to on-demand planning and managing uncertainty (core in digital transformation overall) in far less pre-determined logistical scenarios. In the end the traditional pyramids we are used to see in supply chain management and logistics are poised to be disrupted. While we aren’t fully in that stage yet and most organizations start to explore the possibilities of smart logistics and supply chain management, others are taking the lead or forced to move faster to meet demands of the stakeholders in their ecosystems (including internal stakeholders). The road ahead is one of more autonomy across various logistics components such as supply chain logistics, inbound logistics, warehouse management, intralogistics or line feeding, outbound logistics and logistics routing. One of the best images depicting the evolutions towards more autonomy across all these areas is the roadmap image from UNITY Consulting and Innovation which you see below. In that roadmap a highly autonomous, flexible and predictive picture is painted in later stages, even up to the point that there is no more warehouse in the supply chain. With regards to the future stages as shown in the image, before we would ever get there quite some challenges arise and changes are needed and the macro-economic context would have to seriously change (leaving aside regulations regarding security, the digital economy and the organization of work). Today everyone most people have heard – or even deploys or test – one or more of the several applications which have been known for years: autonomous vehicles, swarm intelligence, AVGs and trucks, smart shelves that organize their replenishment, smart containers that organize their supply chains, bins and so forth. Yet, as per usual it’s not just about the technologies, even if newer technologies keep being added, for instance on the level of interfaces, blockchain, new advancements in AI and machine learning, better drones in logistics, cobots, the list goes on. It’s about the way logistics and supply chain management meet the needs of all stakeholders, knowing that flexible, smart supply chain decisions, enabled by the human, organizational and technological components of Industry 4.0 and logistics 4.0 make the difference in gaining competitive benefits but also in surviving in a hyper-connected age where the need for speed is high and regardless of the supply chain, performance and speed are crucial but so is quality. To put it simply: having a smart container is one thing, being able to track what’s inside it, where it comes from and in what state it is, that’s when you start reaping the benefits of a strategic and holistic approach that looks at the value and customer demand. Top image: Shutterstock – Copyright: one photo – warehousing image: Shutterstock – Copyright: Jojje All other images are the property of their respective mentioned owners.